Yesh. Two weeks left till i leave. And… I think I’ll be ready. I’ve been a bit of a slacker on posting updates lately, as i’ve been so busy. but progress has been made. I have my new Ocean Rodeo Ignite drysuit. This thing is great. Decided to take a shot with the boat on the trailer, to give a sense of scale. 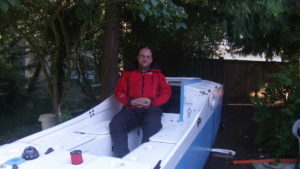 In addition, My wool union suit from www.wool-underwear.com; Worn underneath it really makes the drysuit comfortable. I’ve got the compass mounted, although the LED kit has not come in at Captain’s Nautical Supplies. Once it comes in, It’ll get patched into the navigation light circuit. The location and selection of the compass gave me some problems. There’s nowhere to put it forward where it wouldn’t potentially be in the way or snag on something. 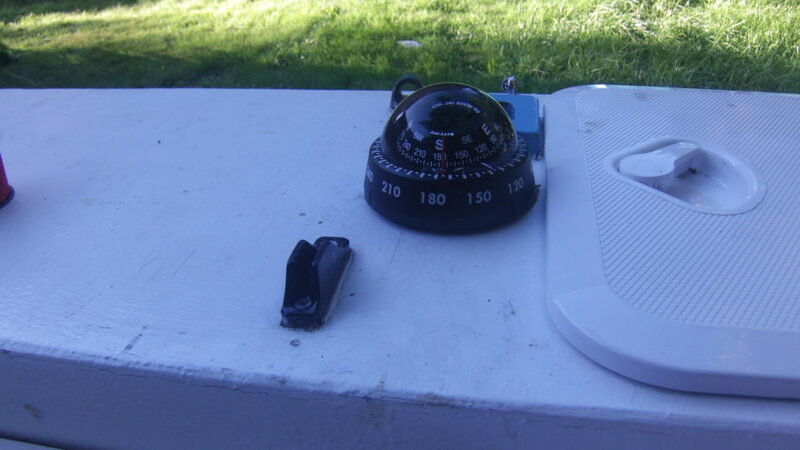 I ended up mounting it Aft, and went with a reverse card Rower’s compass from Duckwork’s Boat Builder’s Supply. This compass has the unique feature in that it reads 180 degrees off; when you look at it it gives you the heading behind you. Perfect for rowing, good for this application. 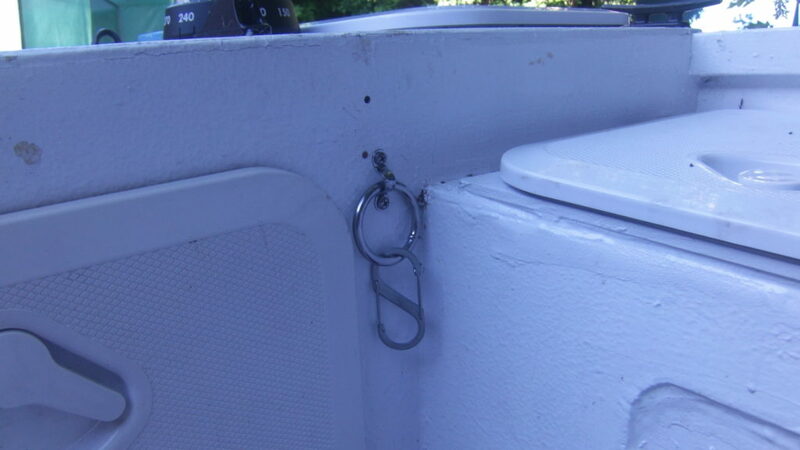 I also finished the attachment points for gear lanyards; my VHF and charts and such will have a leash and an S-ring on the end so i can tie them to the boat. I learned this lesson last year when the boat capsized. Yes, floating VHF radios do float. They also float away if not tied down. 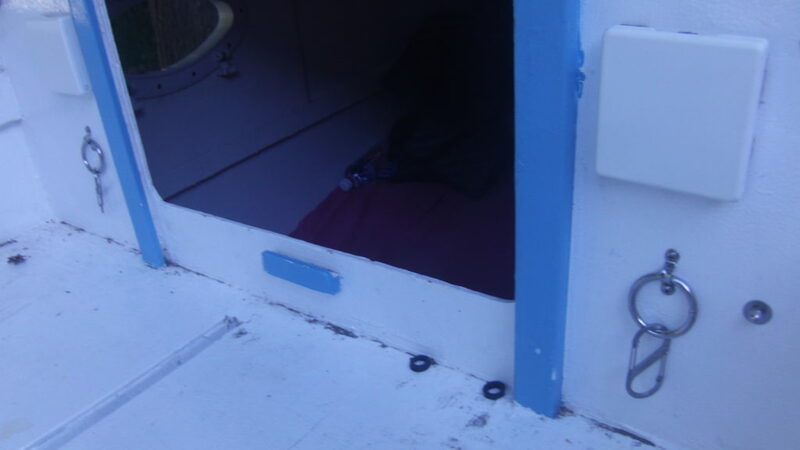 Here they are, on the cabin bulkhead. Here’s the one i mounted aft. I’ve also gotten a new VHF, i went with the standard Horizon HX870. basic GPS navigation, DSC and the like. Looks to be a winner. I’ve also gotten and odd-lot of other bits and pieces of the puzzle; throwable PFD, canned air horn, etc. 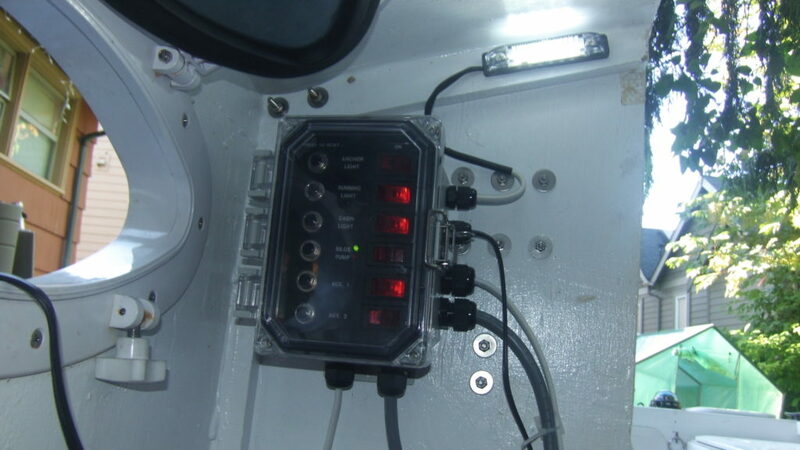 With the addition of the 12v accessory port and the LED cabin light, the electrical panel is complete. Totally waterproof, totally ready to go. I also yard sailed the boat last weekend. Rigged preventers on the masts and the mizzenbumpkin to prevent them from being un-stepped in a knock-down. Also made some adjustments to the rest of the rigging to make the downhaul/vang work better and to get more proper sail shape. Next weekend, iv’e got a shakedown voyage planned. I’m going to head from Seattle to Pt. Townsend for the weekend to attend the Pocket Yacht Palooza. The plan is to head out Friday, June 10th. IT should be a good long weekend trip, and give me a chance to test my gear. Plus, Rick Landreville has offered to go over the sail rigging with me and apply his knowledge from his Puddle Duck racing wins to get rigging dialed in to get the most out of the boat.